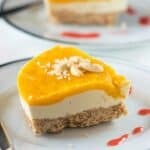 No bake mango cheesecake recipe – Decadent raw vegan style mango cheesecake. A dessert that’s incredibly healthy and simple to make. I’m really loving these no bake cheesecake recipes right now. The last time I made a cheesecake was when I made this chocolate cheesecake – raw might I add. I will be the first to admit I’m not a huge fan of cheesecake well at least the store brought kind. 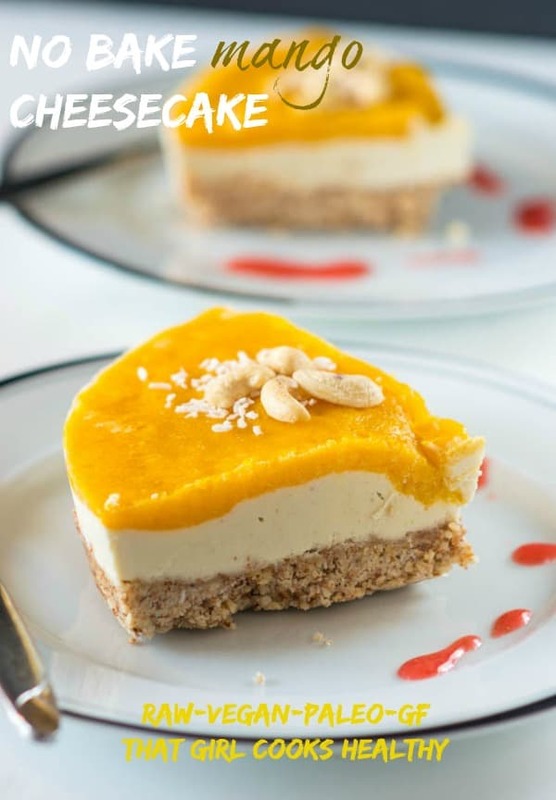 My no bake mango cheese cake recipe is a healthy, gelatin free and taste so amazing and a contrast to manufactured cheesecake which are far too sweet and loaded with unnecessary fillers, most of which feature words that cannot be pronounced. My solution to combating the loathe for factory made cheesecake was to learn how to make it from scratch at home, not just any type of cheesecake but a raw one. 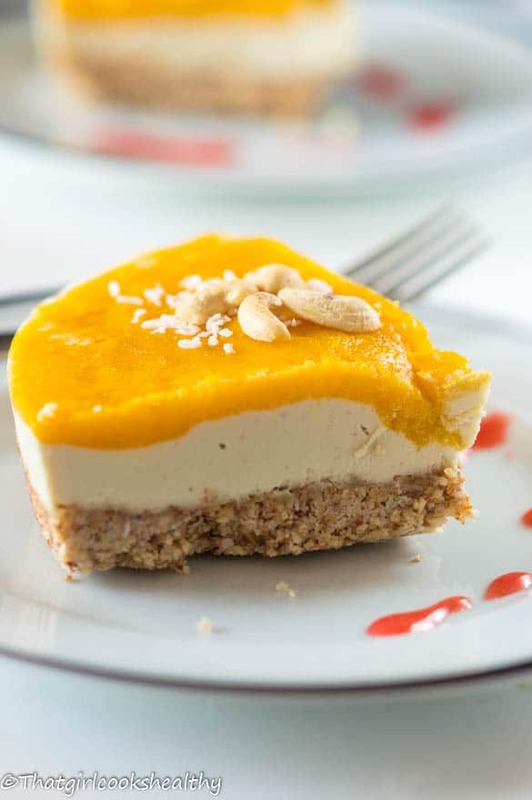 Initially when I first discovered raw cheesecake I was stunned to find out that the majority of ingredients used were nuts/seeds and even vegetables, before you freak out I’ll explain what I mean further down, so don’t click the X button just yet. A no bake aka raw cheesecake is essentially a dessert that’s made from nature ingredients and eaten in it’s unadulterated state. Many raw foodists prefer to consume their foods using this method to procure the full health benefits from eating foods which haven’t been processed. 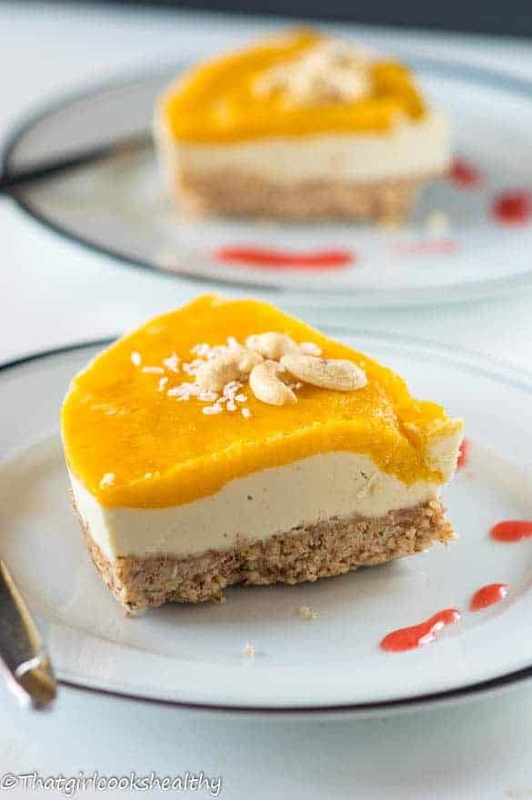 While I don’t lead a fully raw lifestyle I do enjoy eating raw energy balls and cheesecakes which explains why I made this no bake mango cheesecake. 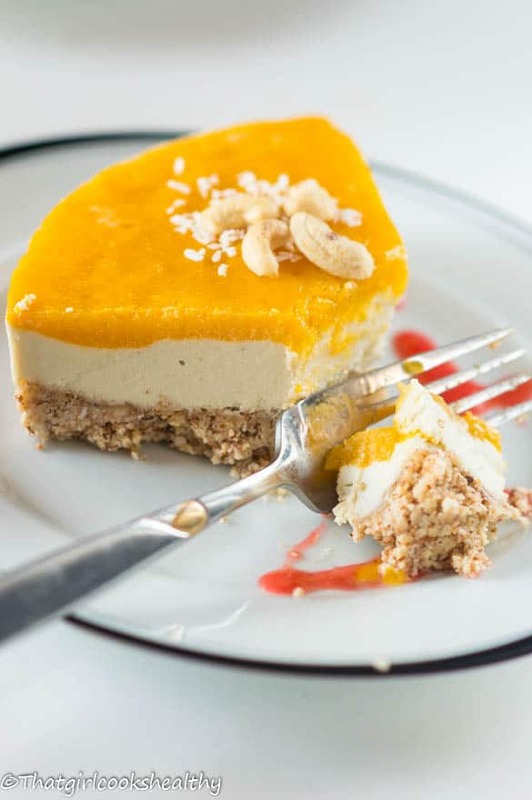 The base of this no bake cheesecake is made from shredded coconut, almonds, coconut oil, a splash of water to soften the meal and a hint of coconut nectar. All of this can be ground to a fine meal using a food processor and a little patience on your end – pulse, pulse pulse. The filling has a surprisingly secret ingredient which helps to yield that creamy texture……drum roll….guess what it is? Give up? It’s zucchini (courgette) that’s right. You cannot taste it which is a huge plus and this is a great way to incorporate more veggies into your diet. Cashew nuts help to even out the white creamy consistency for the filling along with some GI sweetener. 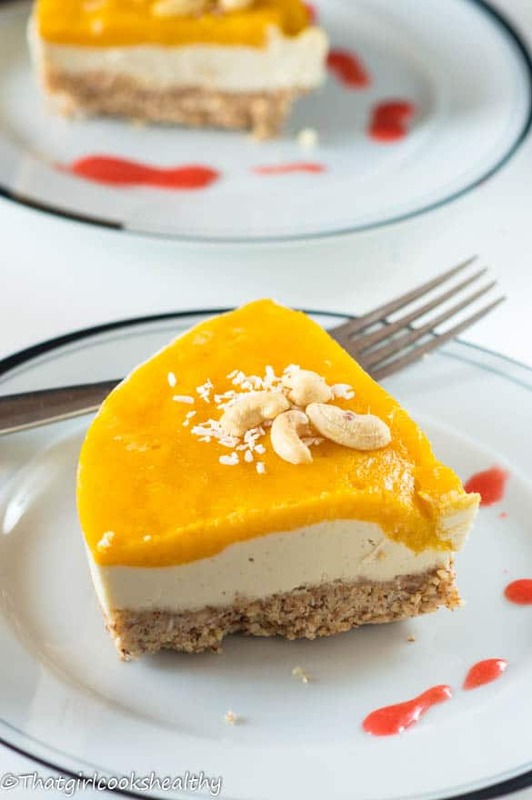 Mango cheesecake topping – Then the last part of the cheesecake is the mango topping made from pureeing a sweet mango. You won’t need to add any sweetener unless the mango isn’t very sweet. How long does the cheesecake take to freeze? The entire cheesecake will need to freeze for several hours or overnight in order for it to fully set. Keep the cheesecake in the freezer at all times until serving. Keep in mind because the topping is made from pureed fruit, it may destablise at room temperature – Eat immediately when serving. Using a food processor with an S blade, pulse the almonds into a fine meal. Add the remaining ingredients (excluding the water) to the almond meal and continue to pulse, you should be left with a slightly moist pliable dough, if not add the water, a tablespoon at a time. Line the bottom of a baking tin with parchment paper and press almond meal down firmly. Set aside and put the tin in the freezer 30 minutes. Meanwhile, pulse the cashew nuts into a fine meal on high speed. Slowly add the chopped zucchini, vanilla, coconut nectar, coconut oil and pink salt to the food processor. Process until a creamy consistency is formed. Remove the baking tin from the freezer and pour the filling onto the base. Allow the filling to set in the freezer for an hour so the top layer spreads evenly and doesn’t sink into the filling. Puree the mango chunks into a smooth consistency. Take the baking tin out of the freezer and spread the mango puree on top of the filling. Finally freeze the entire cheesecake for at least 8 hours or overnight. Mangoes and cashews together are just the sort of thing that would make me become your slave. LMAO! Anything with mango in it has to taste good right? OH MY! This is one Gorgeous looking Cake l! Love the mango flavors in here, one of my favorites. What else can a girl ask for . Is it fully raw with Coconut oil added? Is there a way to leave that out? Can coconut flesh be added? You could try with coconut flesh I’m pretty sure that would work nicely.